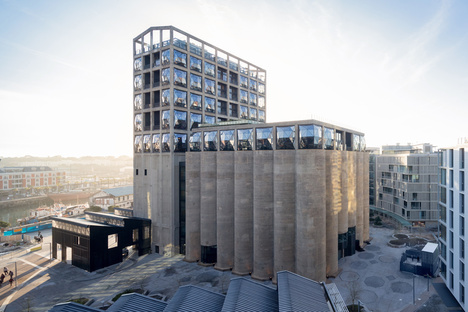 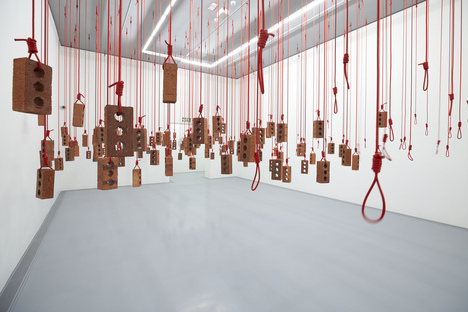 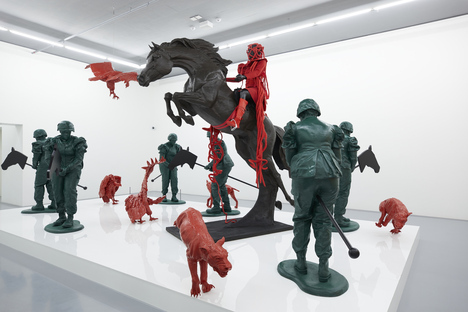 The Zeitz MOCAA-Museum of Contemporary Art Africa project and the conversion of Cape Town’s famous grain silo, opened to the public in September 2017, represents a meeting-point between private interests of great importance in the city. 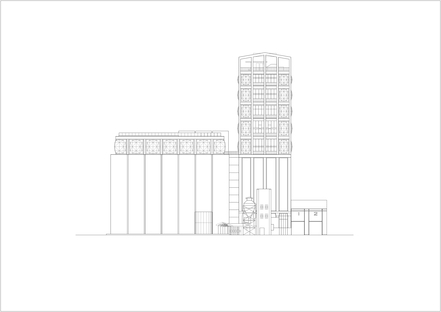 The awarding of the project to eclectic architect Thomas Heatherwick, founder of the well-known London studio of the same name, signals the desire to make this artefact of industrial archaeology into an attraction for urban and national cultural tourism. 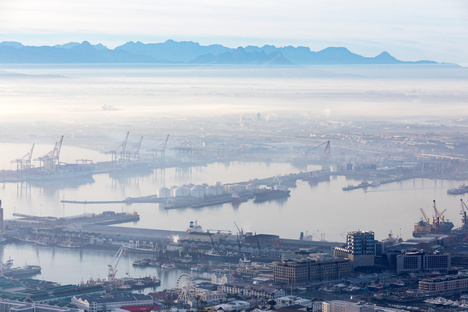 In 2013 the owners of the Victoria & Alfred Waterfront, the city’s nineteenth-century harbour, an attraction for tourists from all over the world squeezed between the ocean and Table Mountain, were trying to think of an appropriate use for this imposing, symbolic building that had been a part of the city skyline for decades. 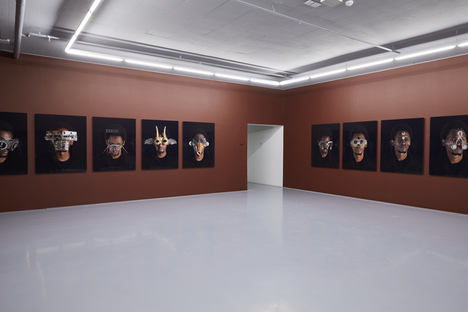 At the same time, German manager Jochen Zeitz, a fan of African culture who has put together one of the world’s most important collections of contemporary art from the African continent and the African diaspora, including works by artists of the calibre of Edson Chagas, Zanele Muholi and Michele Mathison, was looking for an appropriate place to store his priceless collection and exhibit it to the public. 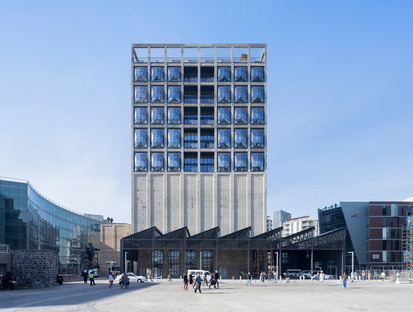 Hence the decision to make the grain silo into Zeitz MOCAA, Museum of Contemporary African Art, entrusting the visionary project for its conversion into an exhibition complex on several levels to London architect Thomas Heatherwick. 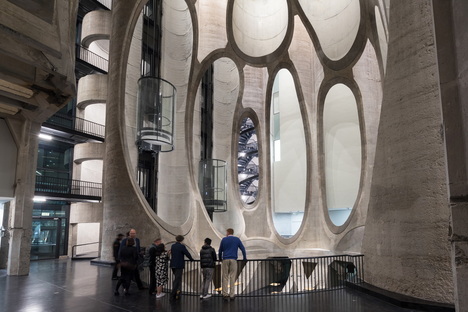 Known for such bold, awe-inspiring structures as the Learning Hub at Nanyang Technological University in Singapore, the Rolling Bridge in the City of London and the Fund Finance Centre in Shanghai, Heatherwick was now offered the opportunity to work on a 57-metre tall concrete structure in the middle of the city. 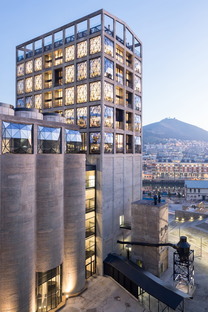 Built in 1921, the industrial construction composed of a tower and 42 grain silos was the heart of the South African capital’s economic life until 1990, in a port where it served to collect, store, distribute and export the country’s grain harvest. 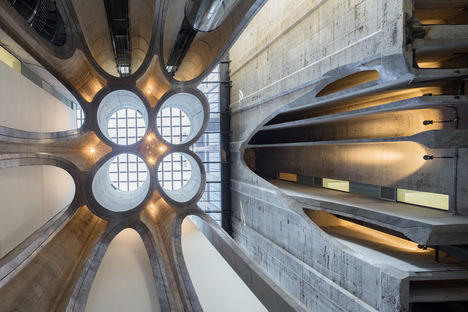 Its brutalist aesthetic did not detract from the attractions of the Waterfront, but became a flag, almost a symbol of the contradictions of South Africa. 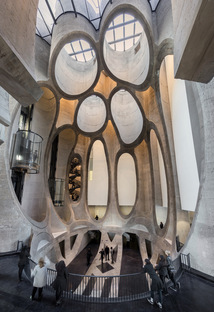 Thomas Heatherwick explains that the technical challenge was a tough one, because he had to find a way to carve out spaces for hosting and exhibiting artworks in a hive of 42 ten-storey tubes without completely destroying the building’s nature, but on the contrary, underlining its specific features. 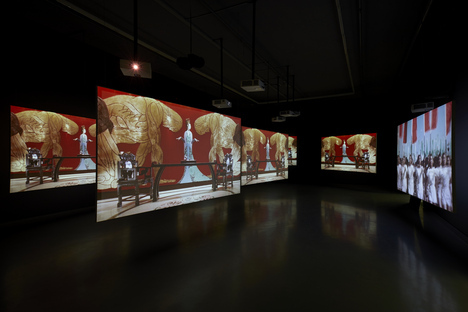 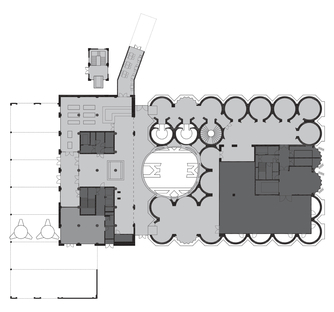 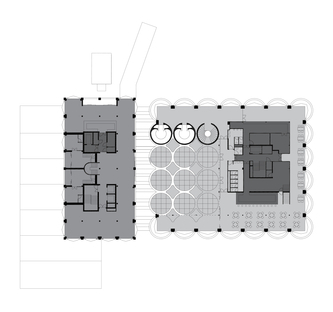 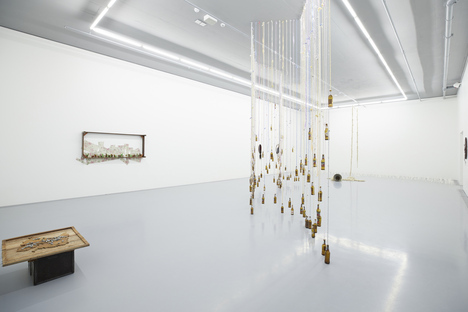 The museum programme allocates 6,000 square metres to exhibition space in 80 galleries, with a rooftop sculpture garden, storage areas, a library, reading rooms, a restaurant and a bar. 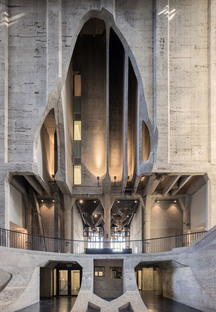 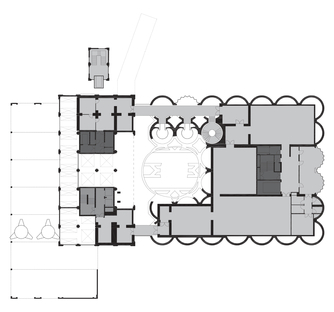 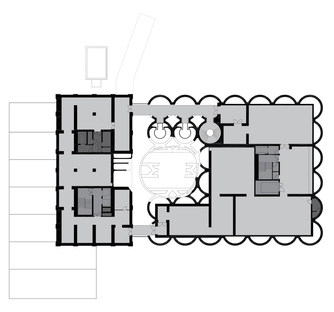 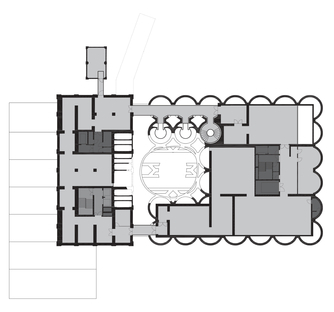 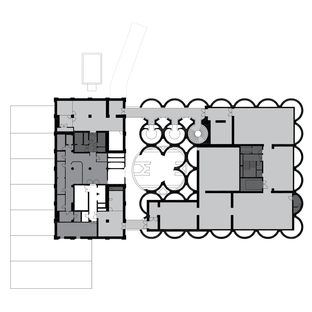 The original idea was to use 9 of the innermost silos to contain the foyer, making the most of their height to create an impressive public space. 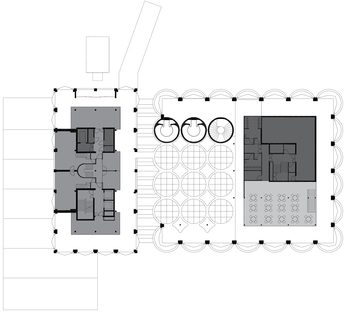 The silos are imagined as a single solid block, with their volume intersected by an ellipse. 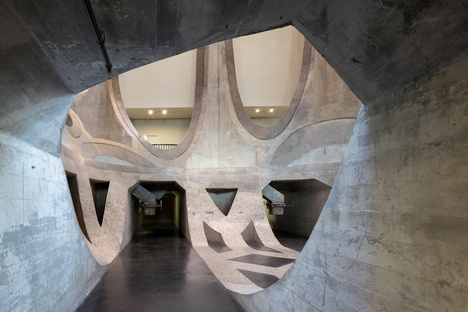 The ideal intersection between solids leaves tubular sections in view, reproducing the brand new structure embroidered on it in cement. 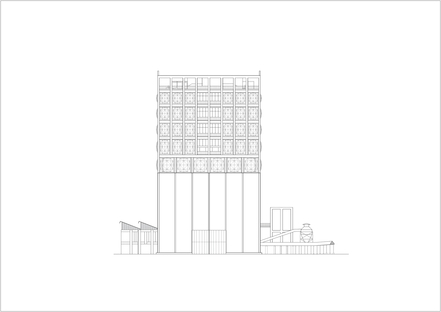 This structure was then reinforced, reaching thicknesses of up to 420 mm where the original thickness was only 170 mm, to compensate for the removal of original parts of the silos. 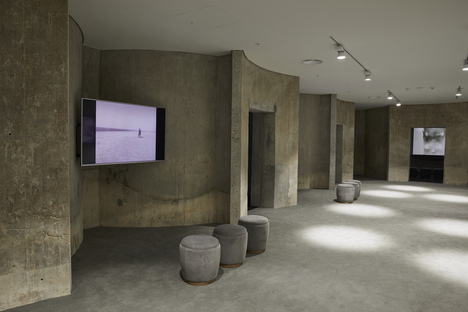 The cut edges were polished to a mirror sheen to contrast with the aggregate of unfinished concrete that forms the building. 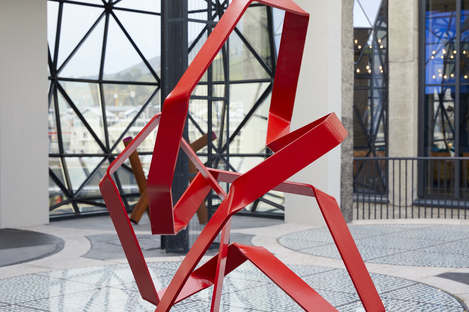 In addition to this, its height is exploited to create a node connecting all 9 levels. 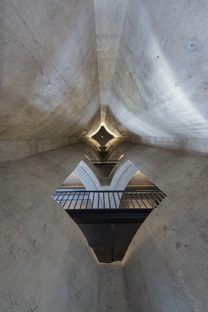 While the entire base of the big silo was left practically intact on the outside and simply cleaned up, there were more changes to the upper part, where the tower rises over the sculpture garden and the top levels of the exhibition area. 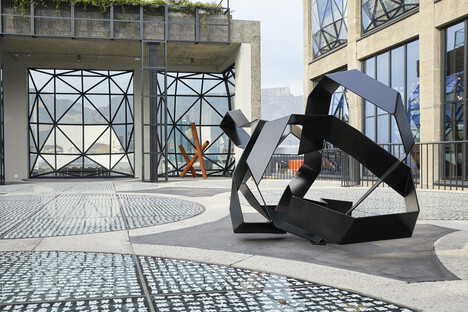 Here the architects say they drew their inspiration from the Venetian glass-making tradition, redesigning the structure as a giant lantern, a lighthouse over the Cape Town harbour. 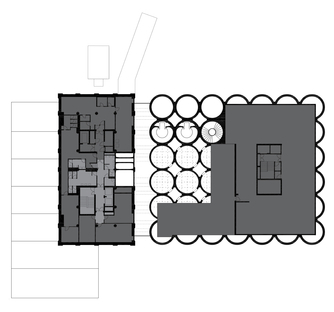 In five floors the concrete walls have been replaced by a grid of multi-faceted convex structural glass assembled on steel frames, creating a surprising contrast in scale between glass objects and glass architecture. 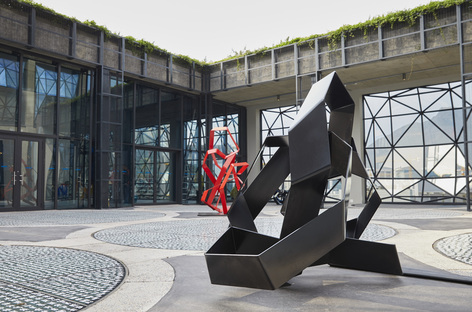 As Alberto Campo Baeza would say, a lightweight, knotted tectonic element is grafted onto a heavy, stony stereotomic element, almost making it explode. 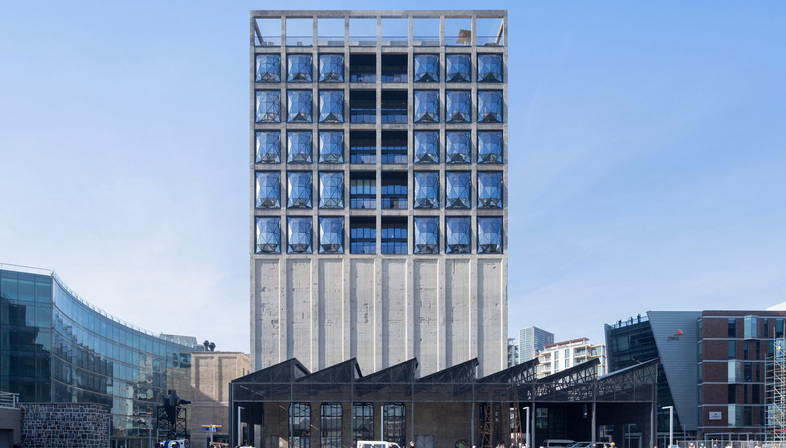 The Zeitz MOCAA looks as though it is about to explode with energy, but as it cannot do so, the energy impregnates it and is conveyed to anyone looking at it.